For other uses, see Set list (disambiguation). 9" × 12" laminate set list from a Dixie Chicks concert in 2003. In this instance, the keys the songs are played in are also given. The horizontal line (or a wide blank space) near the bottom delineates the encore. A set list, or most commonly, setlist, is typically a handwritten or printed document that is created as a blueprint for a performance that lists the order of songs, jokes, stories or other performance elements that an artist intends to play, or has played, during a specific performance. (In the case of music concerts, the website setlist.fm defines a setlist to be the list of the songs a band or artist actually played during a concert). A setlist can be made of nearly any material that can be written or printed on, but are most commonly made with paper, cardboard, or cardstock. They are also often laminated as well, especially for outdoor stage settings. The set list is usually taped directly to the stage in front of the performers, or somewhere the musicians can see it, such as to a monitor or amplifier. Artists use setlists for a variety of reasons beyond just being a reminder of the order in which their material is to be played during a performance. They are most often used to help the artist or band to create the overall mood of a live performance by allowing them to create a memorable sense of range and variety in the tone, tempo, and dynamics within their performance, which is often a factor in creating great performances that fans will talk about for years if not generations. They are also used to create sets for a specific audience or location, an increasingly popular idea that is aided by the use of today's technologies like the use of instant polling on social media and websites, where fans can choose the material to be performed. Many performers also craft their playlists in ways that highlight other elements of their stage shows such as the visual ambiance of the stage, choreography, or in an order that defines things like different albums or eras of their career. Music fans also refer to the set list in the non-physical sense of what a performing artist chooses to play. For many artists, the same set list is played for every performance on a given concert tour. For others, this is not necessarily the case, and for their devoted fan bases who follow the artist around on tour, the most variety in the setlist from night to night is longed for. The Grateful Dead is one example, having never played the same set list twice in the band's entire existence. Some such artists have predetermined "slots" in an otherwise mostly fixed show where different songs can be swapped in and out; other artists guarantee that the same song will not be played at two shows in a row; and still other artists such as Van Morrison use no predetermined set list at all. There are websites that track and report information on such things as the venue and bands on the bill of each date, as well as which band members were in attendance, copies of the show posters and other memorabilia available, and most importantly, the actual setlist used for that particular event. This is done to provide a more accurate record of each individual show, which is later used to differentiate between performances during a tour, as many artists will change their setlist from one night to another. In the pre-smartphone era, devoted followers attending concerts of popular artists such as Bruce Springsteen or Led Zeppelin, which have very large fan bases spanning the globe, often took on the task of tracking which songs were played and in what order, creating their own handwritten version of the correct setlist for the event to be shared later with other fans through fan clubs and other forums. When early cellular phones became commonplace with the general public, people began using text-messaging to report the songs played in real-time to a friend or fellow fan who would then update a running setlist on one or more Internet forums devoted to the performer of the night. When internet-connected smartphones came about, fans began to post the setlists directly to these forums and websites themselves, often as part of a running play-by-play commentary of their concert experiences on social media sites such as Myspace and later Twitter. Collecting setlists has become nearly as popular for music fans as collecting ticket stubs and show posters, with the actual physical setlist becoming a treasured and uniquely rare souvenir for concert goers and fans of music, in general, . Fans often wait around after a concert just so they can grab one off the stage after a performance or so they can try requesting one from a roadie or other event staff. Crew members also sometimes keep items like original setlists, guitar picks, drumsticks and other items used during a performance as keepsakes or to later sell in the memorabilia market or on auction websites such as eBay, where collectors, fans, and concert attendees who are looking to the highlight their own experience of a particular show can purchase them for their own collection. In some cases, so great is the urge for a fan to obtain a setlist that they don't always wait for a show to end before trying to get their hands on a setlist. ^ "The Perfect Set List For Remembering Your Material". creativestandup.com. Retrieved 2018-11-18. ^ "About | setlist.fm". 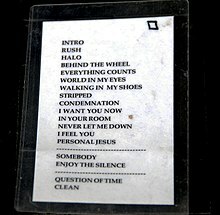 www.setlist.fm. Retrieved 2018-11-18. ^ "The Art of the Set List: Choosing the Right Songs in the Right Order - DIY Musician Blog". DIY Musician Blog. 2013-08-19. Retrieved 2018-11-18. ^ "Wilco Tap Into Creative Setlist". glidemagazine.com. Retrieved 2018-11-18. ^ Michaels, Sean (2013-11-27). "Metallica ask fans to pick their setlist". the Guardian. Retrieved 2018-11-18. ^ "The Chicago Choreographer Behind Smashing Pumpkins' Reunion Tour". Chicago magazine. Retrieved 2018-11-18. ^ "A Look Inside David Byrne's American Utopia Tour". setlist.fm. Retrieved 2018-11-18. ^ "Gallery: The Setlists We've Nabbed". NPR.org. Retrieved 2018-11-18. ^ "Video: SEBASTIAN BACH Stops Show After Fan Steals Setlist, Injures Fellow Concertgoer". BLABBERMOUTH.NET. 2015-06-17. Retrieved 2018-11-18. Wikimedia Commons has media related to Set lists.